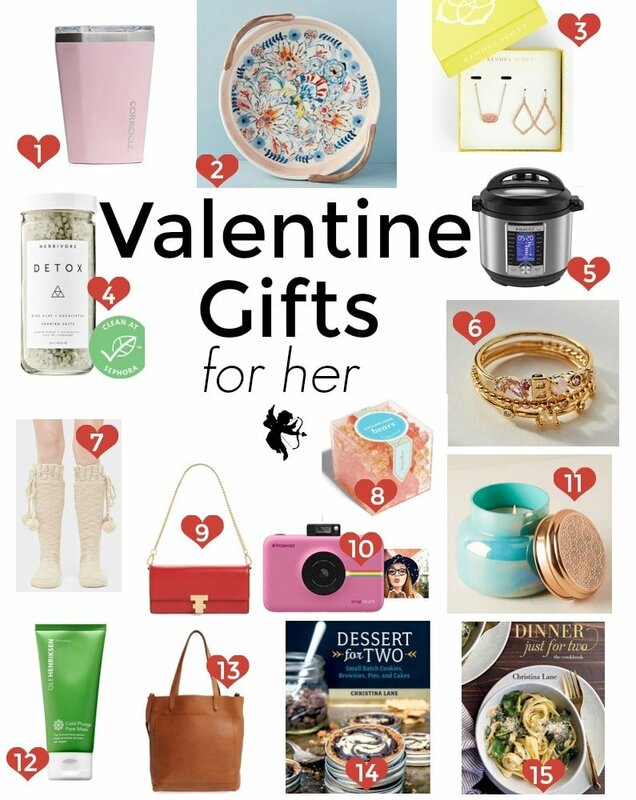 Valentine’s Day Gift Guide for Him and Her! Valentine’s Day is my absolute favorite holiday, and yes, I felt this way even when I was single. It’s a holiday all about love, and all we’re have to do is show our love. Often, we’re only buying one gift for our special someone, and so we have plenty of time to think about the right thing to buy. At Christmas, I find I’m often in such a rush that I can’t put as much effort into every single gift. But, I spend the entire month thinking about my Valentine’s Day gift for my dude. Plus, my wedding anniversary is a few weeks later, so if I can’t decide between two things, I get both! I compiled a list of Valentine’s Day gifts for him and her! 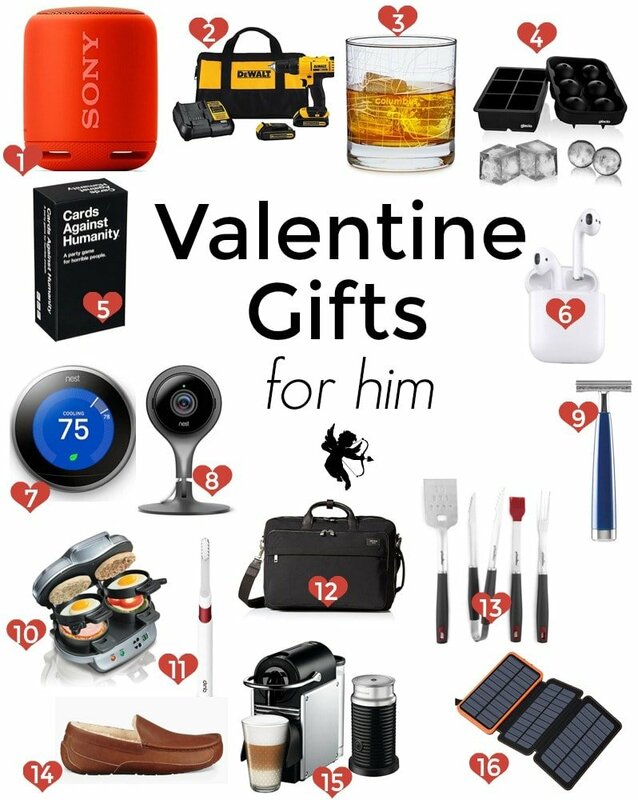 First, let’s talk about Valentine’s Day Gifts for Him. SONY BLUETOOTH SPEAKER We’ve had one of these in our kitchen for over a year now, and nothing gets used in our house more. It’s portable, completely wireless, and bluetooth compatible. Make sure your dude isn’t using a speaker from the 90s; get him up to date! DEWALT COMPACT DRILL I thought men only needed to buy one drill in their lifetime. My husband recently educated me that newer drills are more lightweight and have longer battery power. Blane updated to this one this Christmas, and loves it so far. CUSTOMIZABLE WHISKEY GLASSES A dear friend gave us these whiskey glasses when we moved away from St. Louis. We love having these glasses with St Louis coordinates in our bar to remind us of all of our good friends back there. LUXURY ICE CUBE TRAYS When luxury ice cube trays first became a thing, I thought they were the silliest thing ever. But now? We always have these in our freezer, because the large cube size makes the ice melt much slower, thus not watering down your dudes drink. I love that these are made of silicone and have lids to protect against any odors! CARDS AGAINST HUMANITY Every dude needs this game in his place. It’s ridiculously fun, a great ice breaker, and it never gets old because the game reinvents itself each time you play. This is my first pick on our game nights with neighbors every Friday. APPLE AIR PODS I’m not a tech person by any means, but even I could recognize how silly it was for my husband’s ear buds to always be dangling from his head. I really hope Blane doesn’t read this, because this is what I’m getting him for Valentine’s Day this year! THE NEST Did your dude just get a new place? Or better yet, did you two just move in together? Get set up with The Nest so you can completely customize and run your thermomstat in the most efficient way possible. The way I see it, the lower your energy bill, the happier your relationship will be. THE NEST CAM This camera syncs with The Nest and can provide additional home security. You can receive alerts when someone arrives home, or when the dog moves from the couch to the chair. And, the speaker option allows you to yell at said dog to get off the chair! Plus, it plugs in so no more dead battery concerns. Buy one for each room or main area. JACK BLACK RAZOR Buy your dude this fancy razor, and it will be the only razor he ever owns. From here, he just buys replacement blades. Plus, it looks sleek and stylish in the bathroom. BREAKFAST SANDWICH MAKER I can’t think of a single dude who doesn’t love a good breakfast sandwich, or post-gym sandwich. This one cooks all of the components at the same time. No more drive-thru breakfast for your dude! QUIP ELECTRIC TOOTHBRUSH Move over Sonicare, the Quip is your replacement. A much smaller, sleeker and more convenient electric toothbrush is here. It sticks to the mirror with a magnet, and comes with a cover for sanitary purposes. Plus, refills are sent every 3 months automatically. JACK SPADE BAG I feel like briefcases are something our dads and grandpas carried; a messenger bag is much more stylish these days. This one has plenty of pockets and fits my husband’s laptop and cords. GRILL TOOLS If your dude didn’t know, you can use regular tools on the grill. Not only are they too short and not high-heat proof, but he’ll burn his hands. This grill set has one of everything he needs to make burgers, chicken, brats, or more. COZY SLIPPERS I mentioned that our wedding anniversary is later in the month, and these are what I’m getting my husband. He’s been asking for stylish but ‘manly’ slippers for a while. I finally found some that he would love! NESPRESSO PIXIE Save your dude some cash at the coffee shop, and get him this Nespresso Pixie. It’s one of the smaller machines that makes the perfect cup of coffee or espresso. It comes with a milk frother, if a latte or flat white is his thing. We have this machine, and love it! SOLAR PHONE CHARGER At first, I thought this would be a good gift for a dude who loves to camp, but honestly, there are so many times we need a phone charger but can’t find a plug. This is also great if your guy cycles or does long-distance running. It charges an airPad 3 times and a phone 5-10 times, depending on the type of phone. SMALL THERMOS This Corkcicle cup is for coffee or wine. Or both. I love mine, and have it in 2 colors! PRETTY PIE PLATE I’m not a woman who makes a lot of full-size pies, but when I do, I’m taking it to someone’s house to enjoy. And for that, I want a very pretty pie plate. This one from Anthropologie is exactly what I’m looking for! KENDRA SCOTT ROSE GOLD JEWELRY My grandma bought me a rose gold ring when I was 8; I’ve been loyal ever since. Except now, it’s super trendy and everyone loves it. This is a pretty rose gold necklace and earring set that she will totally love! DETOX SOAKING SALTS If your girl loves baths as much as me, I have to recommend these salts. They are the best I’ve tried. Plus, you can buy them online at Sephora, so you don’t have to brave that line at the mall! INSTANT POT This is the 6-quart model, and I highly recommend it if your girl is into meal planning, or if she takes her lunch to work a lot. It’s such a time saver, and will change her life! MONOGRAM STACKING RINGS Obviously, please select the monogram that matches your girl’s name. These stacking rings are so pretty and trendy–she will love them! BOOT SOCKS Cozy boot socks are all I really want in the winter. Why is it that January and February are the coldest months of the year? These socks are perfect for wearing with tall boots, and the floppy pompoms are so cute on the outside of her boots! CHAMPAGNE GUMMY BEARS These are such a splurge; Sugarfina is my favorite store at the mall. I happen to love all of their gummies, but these champagne gummy bears take the cake. TORY BURCH PURSE This is such a perfect, classic Valentine’s Day gift! It’s a purse for date night, or a night on the town with her girlfriends. It hangs at the perfect height for me, and now that I have it in red, I want it in all of the colors. POLAROID CAMERA One of my goals for 2019 was to stop hoarding photos on my phone; print them instead and enjoy them more! This is a great system for doing that, and I’ve loved using it so far. FANCY CANDLE If you’re unsure which type of candle to get your girl, Capri Blue from Anthopologie is THE candle. Every person on earth thinks it’s the perfect smell, I promise. COOLING FACE MASK I discovered this Olehenriksen bright blue cooling mask on Instgram, and couldn’t stop thinking about it. If your girl likes to indulge in a sunday night bath soak, a book, and a good face mask, she will flip for this one! MADEWELL TOTE In my opinion, this is the purse that put large tote bags on the map. It also put Madewell on the map, again, just my opinion. This tote is perfection. Just the right amount of softness, the right amount of pockets, and a sturdy handle that she will use for years. Maybe even a decade; mine is going strong nearly 10 years later! DESSERT FOR TWO If you know about me through your girlfriend or wife, she probably wants my cookbook. Just sayin’. DINNER JUST FOR TWO My next cookbook is all cozy, romantic meals for two! You two are going to love cooking together with it! I HAVE some of the things on your “for her” suggestions so I love this!! And I’m a terrible gift giver when it comes to my hubby, so I needed this one. Thanks love.